lower your presser foot: Don't you hate it when this happens? I'd like to see which suit you make. sigh. Whenever I try to save a dollar, I end up spending ten. ah the remnant warehouse...how I miss it. I have moved to Melbourne now and shop at, wait for it...Darn Cheap Fabrics. Great joke in the name but it's just not the same. Maybe you shop promise your self a post baby swimsuit, I'm thinking that high cut stripy number. I had that "bloody well right" moment this morning. Last night I ordered mums annual on line calendar at Snapfish as it was the last day of 40% off. This morning there is an email saying now everything is 50% off and free shipping.......bloody hell!! Too funny and bloody typical in my life too! Typical! I do love that fabric though. In early 2010 I was going to make myself a maternity swimsuit using the Alison pattern on Burda style, I thought I'd add some length to the front piece and ruche it at the side seams to be bump accommodating... but then (after buying all the supplies) I saw a maternity costume on sale for $30 which seemed way less stress, so I still have all the material sitting there making me feel guilty (especially as the former bump is now a 14 month old toddler)... I really should get on with sewing a non-maternity costume with it. I was going to make myself a swimsuit, got the fabric but chickend out and got a fantastic company in Queensland to whip one up to my specs. It worked out a treat. I like those op shop patterns you got - that was good timing that you were there when they were in the shop wasn't it! I would LOVE to make a swim suit but am too BLOODY scared I'd stuff it up! Through all your mishaps, I'm so jelly you got to stop off at Remnants Warehouse! OOOOO I miss it! Ohhh. They got your good, girl! That would drive me bonkers. But, I'd be thrilled not to have to sew a suit too! for both my pregnancies so far i just bought a normal tankini a few sizes larger than i would normally wear and because they're so stretchy they were absolutely fine to wear! i actually got a couple on sale at kmart for about $20 or so... i was very disappointed with the maternity ones i had looked at (both price and design) and was so happy to be able to find some that were wearable (my sisters gave me this advice when i first got pregnant)... i lived in the pool while pregnant... floating around made me feel so much better while carrying all that extra weight! Wow. 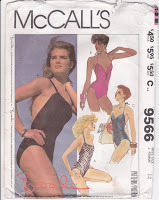 If I could sew, bathing suits would be the first thing I would attack. They don't require a lot of material and they are gorgeous if done right. It reminds me of the time I tried to make leggings for my daughter - as my machine doesn't handle super stretchy fabrics well, I'd settled on a pattern for full leg trousers in a firm knit. I paid an eye-opening $18 for the pattern and cut up two of my still-good-to-wear shirts to make it. Then she refused to wear it!! Oh well with the weather we are having there isn't a lot of swimming going on.